Researchers here have discovered the pivotal role that volcanoes played in a deadly ice age 450 million years ago. Perhaps ironically, these volcanoes first caused global warming -- by releasing massive amounts of carbon dioxide into the atmosphere. When they stopped erupting, Earth’s climate was thrown off balance, and the ice age began. The discovery underscores the importance of carbon in Earth’s climate today, said Matthew Saltzman, associate professor of earth sciences at Ohio State University. The results will appear in the journal Geology, in a paper now available online. Previously, Saltzman and his team linked this same ice age to the rise of the Appalachian Mountains. As the exposed rock weathered, chemical reactions pulled carbon from Earth’s atmosphere, causing a global cooling which ultimately killed two-thirds of all species on the planet. Now the researchers have discovered the other half of the story: giant volcanoes that formed during the closing of the proto-Atlantic Ocean -- known as the Iapetus Ocean -- set the stage for the rise of the Appalachians and the ice age that followed. “Our model shows that these Atlantic volcanoes were spewing carbon into the atmosphere at the same time the Appalachians were removing it,” Saltzman explained. “For nearly 10 million years, the climate was at a stalemate. Then the eruptions abruptly stopped, and atmospheric carbon levels fell well below what they were in the time before volcanism. That kicked off the ice age,” he said. 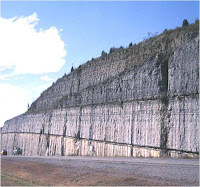 This is the first evidence that a decrease in carbon from volcanic degassing -- combined with continued weathering of the Appalachians -- caused the long-enigmatic glaciation and extinction in the Ordovician period. Here is the picture the researchers have assembled: 460 million years ago, during the Ordovician, volcanoes along the margin of what is now the Atlantic Ocean spewed massive amounts carbon dioxide into the atmosphere, turning the world into a hothouse. Lava from those volcanoes eventually collided with North America to form the Appalachian Mountains. Acid rain -- rich in carbon dioxide -- pelted the newly exposed Appalachian rock and wore it away. Chemical reactions trapped the carbon in the resulting sediment, which formed reefs in the vast seas that covered North America. For about 10 million years, the volcanoes continued to add carbon to the atmosphere as the Appalachians removed it, so the hothouse conditions remained stable. Life flourished in the warm oceans, including abundant species of trilobites and brachiopods. Then, 450 million years ago, the eruptions stopped. But the Appalachians continued weathering, and atmospheric carbon levels plummeted. The Earth swung from a hothouse to an icehouse. By 445 million years ago, glaciers had covered the south pole on top of the supercontinent of Gondwana (which would eventually break apart to form the continents of the southern hemisphere). Two-thirds of all species had perished. When they started this research, Saltzman and his team knew that Earth’s climate must have changed drastically at the end of the Ordovician. But they didn’t know for certain that volcanoes were the driving force, explained Seth Young, who did this research for his doctoral degree at Ohio State. He is now a postdoctoral researcher at Indiana University. “This was not necessarily what we expected when we started investigating, but as we combined our data sources, the story began to fall into place,” Young said. Using a computer model, they drew together measurements of isotopes of chemical elements -- including strontium from rocks in Nevada and neodymium from rocks in Virginia and Pennsylvania -- with measurements of volcanic ash beds in the same locations. Then they factored in temperature models developed by other researchers. The ash deposits demonstrated when the volcanoes stopped erupting; the strontium levels indicated that large amounts of volcanic rock were being eroded and the sediment was flooding Earth’s oceans during this time; and the neodymium levels pinpointed the Appalachians as the source of the sediment. The new findings mesh well with what scientists know about these ancient proto-Atlantic volcanoes, which are thought to have produced the largest eruptions in Earth’s history. They issued enough lava to form the Appalachians, enough ash to cover the far ends of the earth, and enough carbon to heat the globe. Atmospheric carbon levels grew 20 times higher than they are today. This study shows that when those volcanoes stopped erupting, carbon levels dropped, and the climate swung dramatically back to cold. The timing coincides with today’s best estimates of temperature fluctuations in the Ordovician. Next, the researchers will examine the role of the ancient volcanic ash more closely. While the ash was in the atmosphere -- before it settled around the globe -- it might have blotted out the sun, and cooled the earth somewhat. Saltzman and his team want to make some estimate of this short-term cooling effect to refine their computer model. Meanwhile, Young is just starting to re-analyze the same rock samples, this time looking for a different isotope -- sulfur. This, he hopes, will offer clues to how much oxygen was in the oceans, and how that oxygen may have affected life in the Ordovician.